I have got to tell you about the foundation I've been using all summer long. 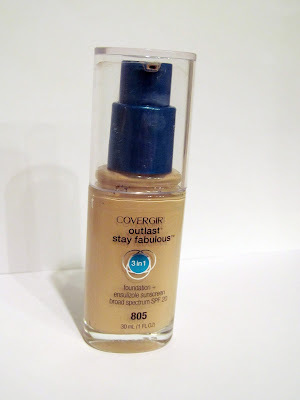 If you read Glazed Over often, you might recognize this Covergirl Outlast Stay Fabulous foundation from my June Favorites. I think this has been my #1 favorite thing this entire summer, and for a number of reasons. In case you're wondering, I'm in shade 805 ivory. First off, this formula is magical. It's no joke that this is a primer, foundation and concealer in one. Thanks to this foundation, I use far less concealer, and never use a primer when I use it. It isn't cakey, it isn't thick, it doesn't oxidize on my face - it is amazing. You need very little to get great coverage (I use one pump with a brush, and two pumps if I use a sponge applicator). It covers some scarring I have on my face like a charm. If I have any blemishes, I usually go over them with another concealer for extra coverage, but the redness is zapped very well with this foundation alone. The wear time of the Outlast Stay Fabulous foundation is exceptional. I put my makeup on for work around 6:30 am in the morning, and get off work at 5 pm and it is still on and looking flawless. You know a foundation is good when it holds your blush on all day, and that's exactly what it does. I typically set my foundation with a powder of some sort, however this is the one and only foundation I've ever used where I can actually skip this step if I want to. Once applied and dried, it finishes matte on the skin and doesn't require any sort of setting powder on my dry/combination skin to keep me shine-free. To top it all off, the pump applicator is awesome. It makes the foundation easy to get out of the bottle, and once it gets low, it's easy to get the foundation off the pump manually. Hands down, I would recommend giving this foundation a try. You can find it at most any drugstore, and it can usually be purchased for under $10! You can't beat that! If you've tried the Covergirl Outlasts Stay Fabulous foundation, let me know what you think of it in the comments below!